Our ADA access ramps can be added seamlessly to 12″ tall plastic border systems. You can order the full ramp (both “up” and “down” sections), or a half-ramp. 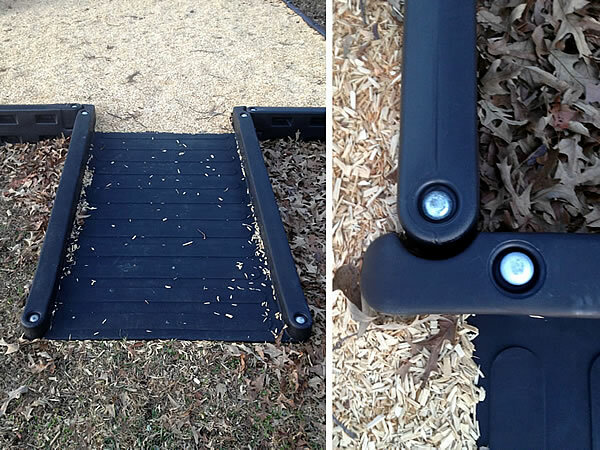 If you have plastic timbers on your playground, make sure all of your kids can access everything! The Americans with Disabilities Act (ADA) mandates accessibility for special needs individuals into play areas. Our plastic borders are a great, stylish way to retain playground surfacing, but they range in height from 6 inches to 12 inches tall, which can prevent access by some special needs individuals. So, these ADA playground ramps fit neatly into plastic border systems to provide easy access for infants and physically challenged kids. The width of the ramp is exactly 4 feet, so it takes the place of one 4-foot border timber. These ramps are made from tough roto-molded plastic, so they will last for years. Available in black or blue. easy access and order today! easy access in a smaller space. ramp to either exit or enter a play area. Two views of a half-ramp in place. 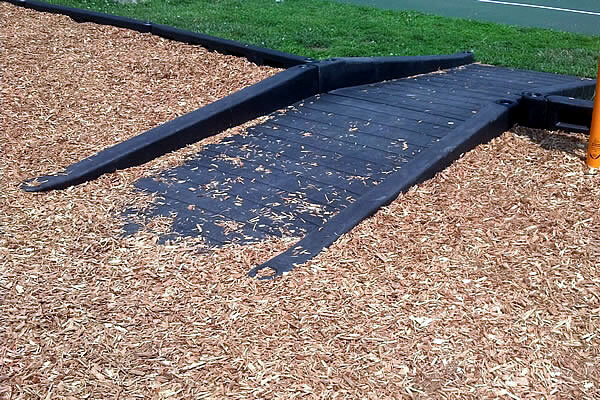 Left: the ramp leads up to a playground with engineered wood fiber. Right: A close-up photo of the connection point where the plastic border section (aligned vertically in the photo) meets the ramp (horizontal section). The main source for information on playground ADA requirements is the United States Access Board. To see their guidelines for play areas, just click here. There, you’ll find helpful information on play equipment and the presence of accessible routes within play areas, a complex subject that is growing in importance. Our ADA playground ramps are an accepted means of complying with the Access Board’s requirements. Before you go ahead with any playground work, it’s good to get the official version of requirements for your play area; there’s a lot of misinformation about special needs access to public facilities out there. Another guiding document for ADA access for playgrounds is the U.S. Department of Justice’s 2010 revisions to the federal accessibility standards. To reach that page, just click here.